Where to go to taste the iconic Milan aperitivo and the many appetizers and buffet included in the price. Milan has a long lasting rivalry with Rome, and has often been nominated (likely by Milanesi themselves) the True Capital: the business capital, the moral capital, and so on and so forth. We may endlessly argue about which town of the two could aspire to the title, but one thing cannot be denied: Milan is the capital of Aperitivo. In no other city of Italy, not even in Venice (read my post on Cicchetti – , or in Bologna, post to come), aperitivo is such a widespread social habit and nowhere else it reaches the same level of locations, glamour and food. Yes, food. In most Italian cities, the typical aperitivo consists of a drink accompanied by modest snacks such as potato chips and olives (if you are lucky enough not to receive only the drink…). In Milan, you can expect to be offered an endless variety of dishes such as pasta, risotto, salads, ham, cheeses, meat balls, sausages, bits of pizzas and even exotic food such as sushi or curry, often served as an “all you can eat” buffet. For this reason, for many busy Milanese, as well as for the smart travelers, the aperitivo becomes a clever alternative to dinner at the price of a cocktail (from 5 to 15 Euro). Top locations are usually poshy and trendy and, during the good season, they may give you the opportunity of discovering and enjoying carefully hidden gardens and courtyards. There are literally hundreds of nice places to have aperitivo, and new ones pop up every day. I’m going to share with you my favorites, leaving to you the pleasure of working out your own selection. The coolest locations usually get pretty crowded, and it’s not uncommon to see a huge crowd of happy drinkers gathering on the sidewalks, a glass in their hands. That’s perfectly OK, but if you prefer to relax instead of standing up, you should consider reserving your seat. 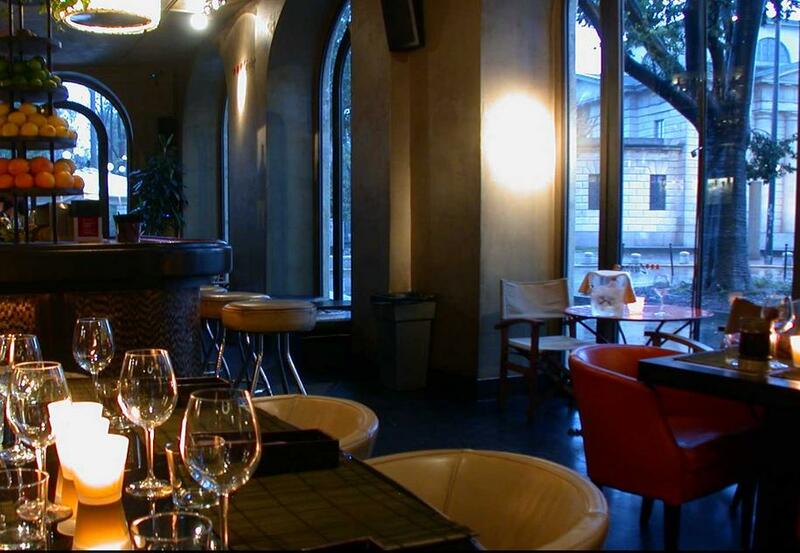 One of the most trendy places for an aperitivo. The Milano is the last creation of the Royalto group (which includes the also Royalto and the Invillà, all recommended). It is build in a huge former garage (!! ), which has been furnished in a ’60s style, with original furniture. Hence, the Milano looks more like a trendy living room than like a bar. Several food islands, catered by Indian personnel, will serve you cold and hot dishes (sizes are minimal, you can eat how much you want, but will have to queue again!). In the summer time you can eat on a nice terrace to escape the heat. 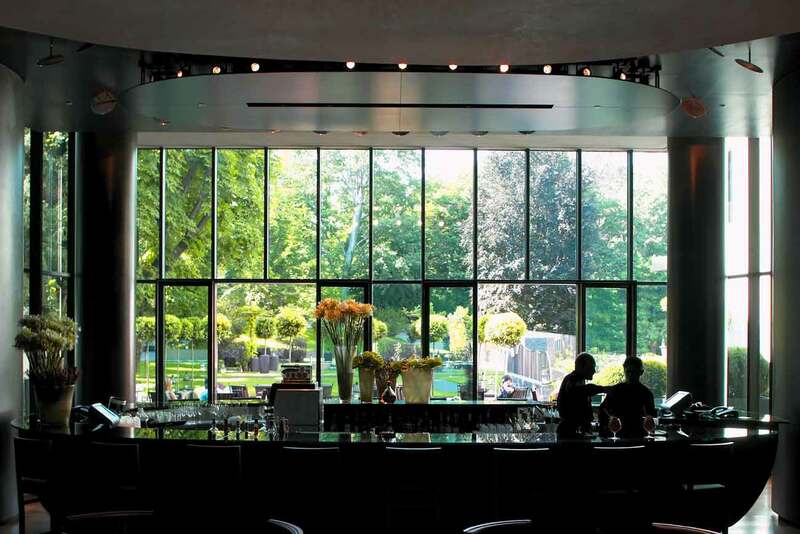 The Diana is the bar of the down town Sheraton. Located in a crowed area, 100 meters from Porta Venezia, you would never imagine that the 19th century building hides a large and beautiful garden. That’s why the Diana gets fairly crowded in the summer time. To escape the mosquito or when the weather gets colder, you can sit in the “normal” bar, under gigantic desk lamps. 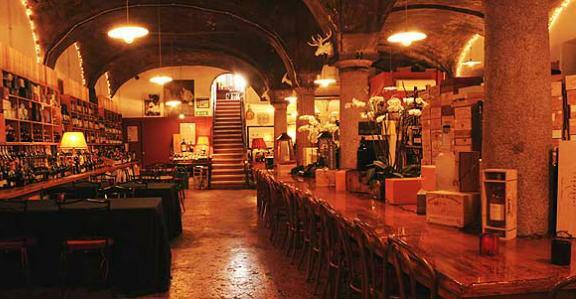 Located in Brera, N’ombra de Vin is a fantastic wine bar, build in an ancient basement, which used to be the refectory of the Agostiniani friars. Original marble columns supporting the vaulted ceiling, wine bottles of all sizes everywhere, low lights: old atmosphere at its top! You should come to N’ombra de vin if you are looking for excellent wine and for the feeling of ancient Milan. N’Ombra de Vin also organizes wine tasting lessons. Italian sophisticated elegance at its best. 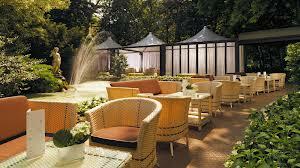 The Bulgari is the bar of the Bulgari Hotel, one of the best hotels in Milan. Here again, you will discover an incredible garden, where you could indulge sipping a glass of Gewurztraminer , while observing the “bel mondo” (“high society”) sitting next to you. Prices are not cheap (18 € for a glass of wine), but the appetizers being served with the aperitivo is excellent and the waiters will keep on refilling your plate until you leave. 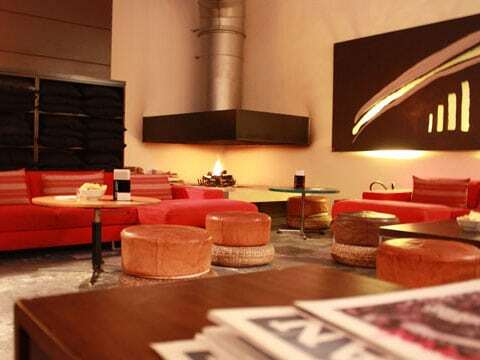 Very popular, located in the pedestrian area around Arco della Pace, the Living is one of the many successful bars created by Fabio Acampora (the others, also recommended, are the Circle, the Exploit and the Refeel). You will find a huge selection of appetizers but expect to fight hard to get to the counter in the busiest hours. You can either eat inside or outside, with a nice view on the park. 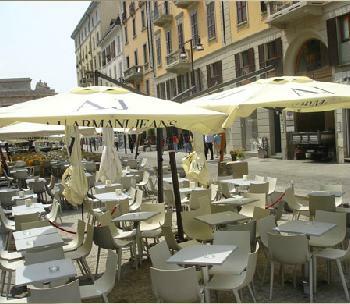 In the same pedestrian area you will find many other nice bars and restaurants, all worth trying. It’s a simple bar, but gives you the possibility of sipping a drink in beautiful corso Como, while contemplating the contrast between the pedestrian 19th century street and the 21st century skyscrapers that are popping up all around. The waiter will serve you basic appetisers, but you can fill (and refill) your plate at the buffet inside the bar. 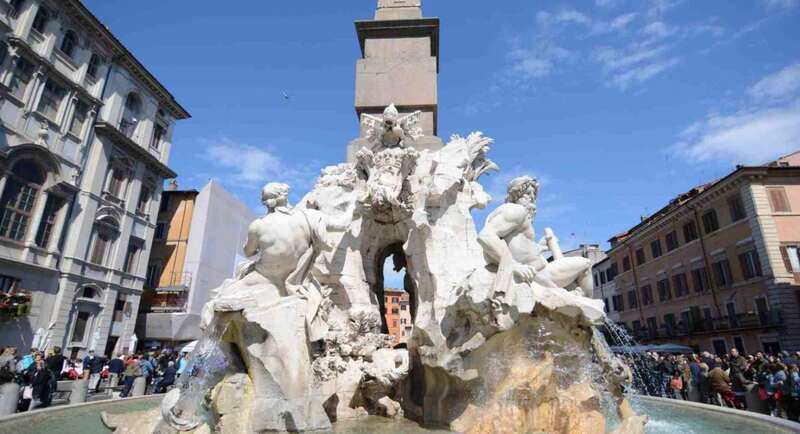 In front of the Novecento you will also find the famous, trendy (and expensive) 10 Corso Como, which you could try for a drink or a dinner if you are looking for a fashionable evening. Exaggerated, kitsch, expensive, well, exactly what you could expect from the famous Italian Fashion designer Roberto Cavalli. The Just Cavalli is located in a fantastic location inside Parco Sempione, just under the Torre Branca (same entrance, you could take the opportunity of enjoy the view after you are done with your drink). 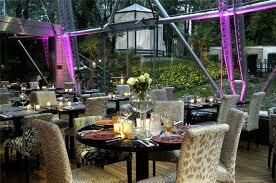 I wouldn’t suggest having a dinner there, but the place is perfect for a posh aperitivo.